If you now own Maine land or are looking for acres for sale, Google Earth can help make your ownership or investment search more productive. With the 3D views and the ability to zoom in our out at different angles of approach, you will gain new knowledge about how your land relates to the surrounding terrain. If you do not have Google Earth it is a free download and the link to it is HERE. A feature of Google Earth that can help you map your property is the polygon tool. The following is a quickstep by step process to get you started using this tool. First open Google Earth and locate the area of interest (AOI). If you are brand new to Google Earth you can type in the town you are looking for in the upper left corner of the screen under SEARCH. Zoom in on the location of your property. It helps to have a good idea of where the property is. 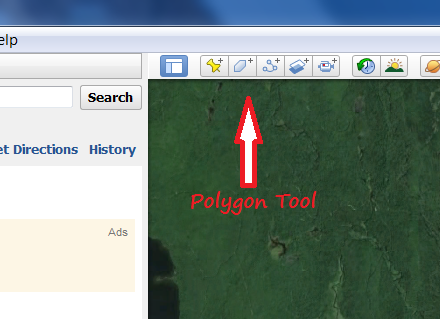 Next, look for the tool bar on the top of the screen and locate the add polygon tool. 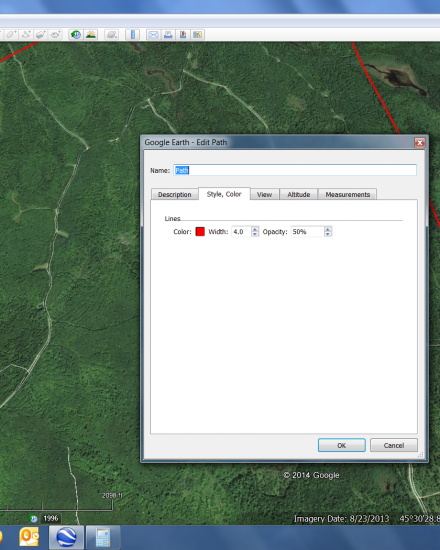 Click on the tool and you can begin to draw lines around the approximate location of your piece of Maine. Begin by clicking your mouse on a known corner of your property. Move the cursor to the next corner and click the mouse. You will notice the lines are beginning to form the boundary, when finished selecting all corners you will have a shape of your lot. To make it easier to see select Google Earth - New Polygon box select style, color and change filled + outlined to outlined. You can also use this tool to change the line color, thickness and opacity. Use the description tab to name the polygon and describe what it is. Once you have the polygon done you can right click on it and save it to your computer. File type can be a kml or a kmz, which is a zipped kml. This can be emailed and viewed by others with Google Earth on their computer.